Light is absorbed into black holes and the beams are transferred to other dimensions by the GLOWBOS, who use the light as food! But what's that? The light is gone! It is being absorbed by a greedy space monster! Help the GLOWBOS get back their light! 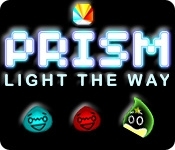 Prism: Light the Way offers highly entertaining puzzle fun and accurately re-creates the physics of light, giving the game an educational aspect.